I've got a few new products from Live Clean to share with you and decided to just bundle them into one post. It's so hard to talk about and review stuff like soaps, body washes, and shampoos, because the results of using different brands can be very similar. 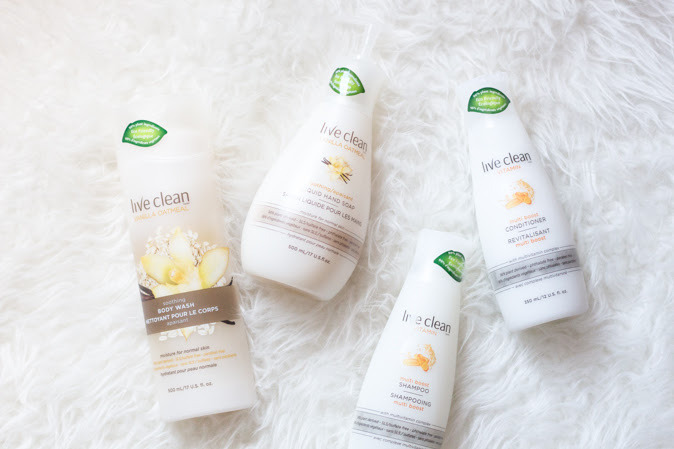 One thing I love about Live Clean is their promise to use good ingredients, they're always about adding moisture to your regime whether it be skin, hair, or hands, and their products cut out a lot of bad ingredients. Live Clean's newest scent, 'Vanilla Oatmeal', comes in both their Liquid Hand Soap and Soothing Body Wash. The formulation was made to be gentle on the skin while adding moisture. The Vanilla Oatmeal Body Wash is enriched with oatmeal and certified organic botanicals of Vanilla and Chamomile to leave skin soft and nourished. Live Clean's Vanilla Oatmeal Soothing Liquid Hand Soap will gently cleanse the skin and contains Vitamin E, Panthenol, and certified organic botanicals of Vanilla and Chamomile. I am in love with the Vanilla Oatmeal Body Wash and it leaves my skin feeling fresh, but not drying. The Liquid Hand Soap also doesn't disappoint but I really wish they had a foaming hand soap available! The Vanilla Oatmeal Soothing Body Wash 500ml retails at $6.99 CAD, and the Vanilla Oatmeal Liquid Hand Soap 500ml retails for $4.99 CAD. 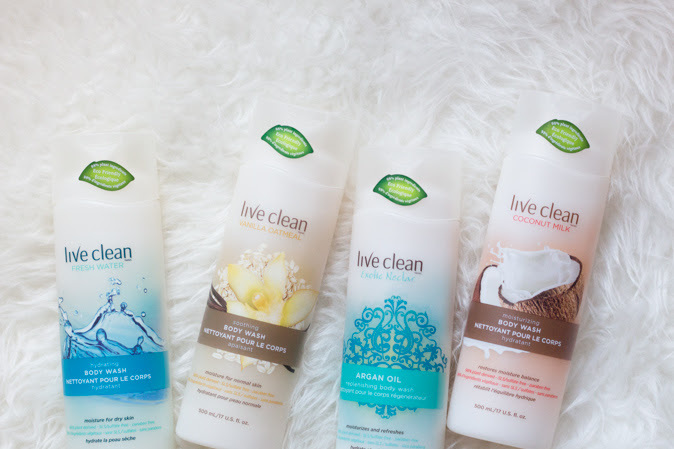 Live Clean also has a small range of other body wash scents! I love the huge size of them (500ml), and the scents are all very gentle and not overbearing. The Fresh Water Moisturizing Body Wash has a light fruity fresh scent, contains Vitamin E and Hyaluronate to moisturize skin. The Exotic Nectar Argan Oil Replenishing Body Wash contains Argan Oil, and smells like what I use in my hair but I think I'd be okay with using it on my body too. And lastly, the Coconut Milk Moisturizing Body Wash smells like sweet coconuts and restores moisture balance with the natural oils in Coconut Milk along with Vitamin C, E, and B, minerals and proteins. They all retail for $6.99 CAD. 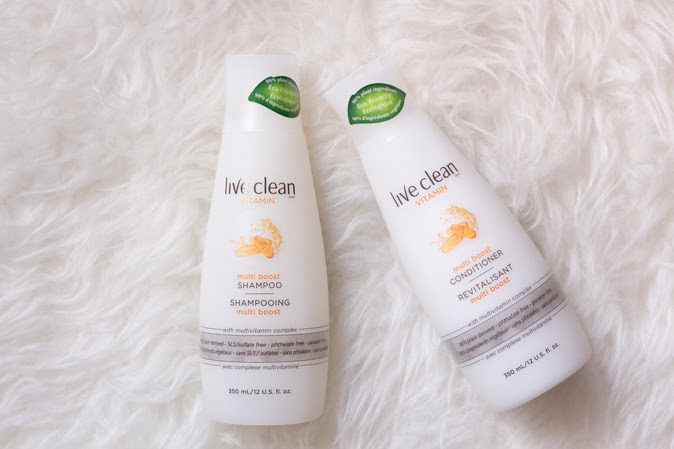 I am always so impressed with all of Live Clean's hair care products, but their Vitamin Multi Boost Shampoo and Conditioner is one of their newest lines and a great hair regime to switch to. Live Clean is drug store bought, but their products seem like such salon quality to me! The Vitamin Multi Boost line has a stronger citrus scent but isn't overbearing. It contains super ingredients like Vitamin E, Vitamin B, Vitamin K, Vitamin D, as well as Avocado Extract to condition and heal the hair. The Multi Boost Shampoo and Conditioner leaves my hair feeling clean, not weighed down or dry, it just feels so right! A main reason I would purchase this again is because of the no sls/sulfates, parabens or silicones! Both bottles are 350ml in size and retail for $6.99 CAD. They are both free of parabens, sls/sulfates, silicones, and are plant derived, never tested on animals, etc, just like all of Live Clean's products. 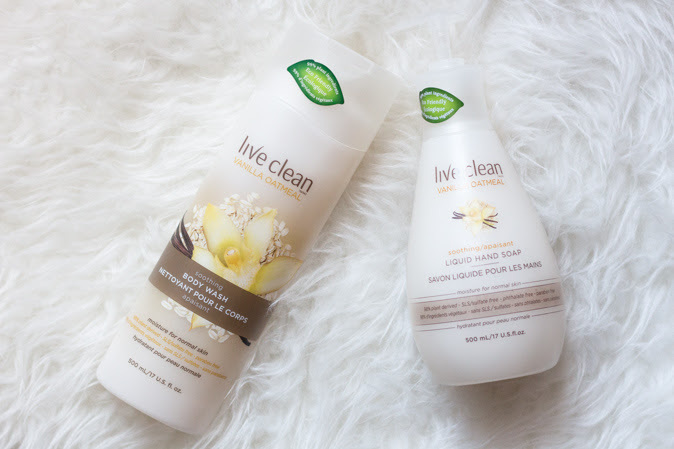 You can find Live Clean products at Shoppers Drug Mart, Walmart, London Drugs, Amazon.ca, and Well.ca.